ROGERSVILLE — Brown cows produce chocolate milk, right? And the food on plates in school cafeterias, at home and at restaurants originates from a kitchen? Making sure Tennessee students in the 21st Century realize both statements are false is the goal of the Tennessee Farm Bureau’s Ag in the Classroom Program and the National Agriculture in the Classroom Program in general and Tanna Nicely in particular. During the week Nicely is the executive principal at Knox County’s South Knoxville Elementary School, but on weekends she presents professional development sessions teaching teachers and teaching assistants how to bring agriculture into classrooms in East Tennessee. Case in point of the need: Retired teacher and Farm Bureau of Hawkins County President Jim Wells told the group of 17 (including me, a reporter who came along with his teacher wife) attending the Saturday session that he recently was having lunch with his great granddaughter Bean Station Elementary School in Grainger County. The retired Cherokee High school vocational teacher asked another first grader where those baked beans on his plate originated. He said the boy answered “from the kitchen” but added they were very good as he finished eating them. 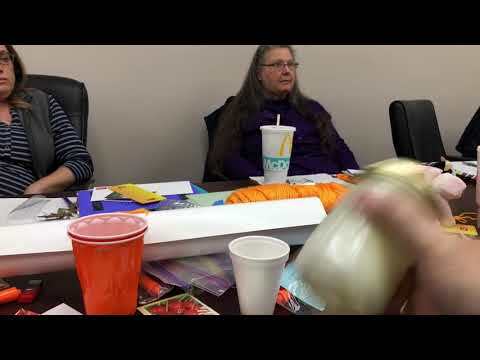 Nicely led the teacher professional development on Ag in the Classroom Saturday, Nov. 3, at the Farm Bureau of Hawkins County in Rogersville, something she said she has repeated across Northeast Tennessee and throughout East Tennessee the past 15 years. She has been in education for 27 years and has a Ph.D, but she lives in Blaine in Grainger County on a farm and grew up on a cattle and tobacco farm, and her parents still garden and raise cattle. Funny, I grew up on a farm with cattle, tobacco, hogs, a mule, a pony and lots of gardening. But I’m just a reporter, not an executive reporter. Of course I don’t have a Ph.D., either. However, I’m the black sheep of the family. I became a reporter instead of working in education or working for Eastman Chemical Co. Many folks on different sides of my family did one, the other or, in my mother’s case, both as a kindergarten aide, assistant secretary and long-time secretary. It also includes a great uncle who was a teacher, principal and school superintendent, but that’s another story. Nicely, the pied piper of Ag in the Classroom has help from her mother, Nancy Hurd. They helped the teachers make butter from shaking cream in a glass jar, make a “feed sack” for themselves and make a pumpkin pie in a bag, as well as putting food coloring in various types of milk to see how surface tension affected mixing of colors and making jack-o-lantern- like creations using a cabbage head, celery, yellow pepper, berries and tooth picks. The group also got to eat home-cooking from the women of the Farm Bureau. If you ever get the chance, don’t turn down that offer. Just trust me on this one. Nicely said her her Knox County grades pre-K-to-5 school, from which you can see the University of Tennessee’s Neyland Stadium, has embraced agriculture and moved from an “inner city” school to a “community school” with the help of agriculture. That includes what she calls a robust gardening program and STEM or science, technology, engineering and math activities at the school. “We love to play in the dirt a lot at my school,” Nicely said. So do the teachers and students at Hawkins Elementary School in Hawkins County, where fifth grade teacher Amy Antrican told the group that a program with two raised beds has grown to six. The grant the first year is $500, followed by $250 each year after that, although schools must apply and be approved every year to continue. Antrican said master gardeners from Hawkins County built the beds. Nicely urged teachers to consider applying for two grants, one Farm Bureau’s Tennessee Ag in the Classroom garden grant and the other a national Agriculture in the Classroom grant to attend the group’s national conference, where she said East Tennessee and Tennessee in general are under-represented. She also said universal free meals, for schools with a larger population of students eligible for free and reduced meals, and fruit snack grant applications should be considered. Nicely may be reached on Twitter @TannaNicely and by email at tanna.nicely@knoxschools.org. The following is online only and did not appear in the Kingsport Times News print edition version of this article. WHAT ABOUT THOMAS JEFFERSON’S PEAS? At her school, students competed to raise the first peas. She said gardening help also can come from the 4-H Club, including its Learn, Go Eat and Grow program, the Farm Bureau and businesses that will donate old, or in some cases fresh, seeds for school gardens. Nicely promotes use of books, newspapers, magazines and other printed materials, even though her school has a 1-to-1 ratio of Chromebooks to students. Especially in the lower grades, she said the tactile connection to books helps students soak in the content. One example is Ag Mag, another a book called “Dig In! Hands-On Soil Investigations.” She also gave out posters on the nitrogen cycle and how plants grow. A misnomer that she said even she once promoted was that going to college was the best path to success in a career and life. She said that worked well for her daughter, who went to East Tennessee State University in Johnson City and is an art teacher and mother in Florida, but that her son struggled with a four-year college and eventually found his way without it. “It took him a while to realize he could be successful without college,” Nicely said. She is writing a book about the experiences of such students, including a girl without a college degree who is a nationally known hair stylist/cosmetologist. She promotes the Tennessee focus on CTE or career technical education, formerly known as vocational education. She said a focus on potential career paths need to start in grades pre-K to 3. Career fairs at her school have students chooses a speaker talking about something that interests them and then go to one speaking about something they never had considered, instead of going from station to station. Her husband, an engineer at a sign company, is proposing an internship program where students from schools in their locality can spend part of the day interning at the business. —Knox Achieves, Knox Suceeds and Knox Reaches are three education programs Nicely said new Knox County Mayor Glenn Jacobs, better known as the wrestler Kane, is pushing although details are yet to come. She said he is “on fire” for education in general and CTE in particular. — Nicely’s fathers family, the Hurds, came from Hawkins and Hancock counties, and that she is a distant cousin of bluegrass fiddler Tammy Rogers of The SteelDrivers. — Nicely readily admitted her fetish is a love of pens, markers and highlighters. She collects them, often donated from manufacturers, for her school and to give out at the professional development sessions on Ag in the Classroom. One was orange and smelled like orange fruit. — Traditions of things like a home-cooked Thanksgiving dinner have gone by the wayside with some people, even in East Tennessee She said a student at her school talked about a traditional Thanksgiving dinner with a “homemade” pumpkin pie but that when she asked, “homemade” meant taking a frozen pie and putting it in the oven. Also, she said the turkey was sliced from a deli. — Garden tip: Planing geraniums in and near your vegetable garden will keep lady bugs away, Antrican and Nicely said. — Those in attendance included Antrican, Hobbs and the these two Hawkins Elementary folks: fifth grade teachers Kristi DeBusk (daughter of one of my science teachers) and Heidi Randolph. Also there was Keplar Elementary fourth and five grades math and science teacher Brittany Martin, as well as Rogersville City School’s second grade teacher Janette Tackett, third grade teacher Matt Price and physical education teacher Jessica Price. Christine Cunningham, a second grade reading and language arts teacher at Mooresburg Elementary, also attended, as did St. Clair Elementary fourth grade teacher Alyson Spirke, and Bulls Gap (K-8) School special education assistant Stephanie Catron, assistant Debbie Stapleton, reading iintervention teacher Sandy Galloway and assistant Spencer Pilcher. Also there were Surgoinsville Elementary kindegarten teacher Amy Arnold and last but not least Surgoinsville Middle sixth grade social studies teacher Vicki Seal, my wife. For the record, I as the 17th person in the group had no direct involvement in the cabbage version of Peppa the Pig, my granddaughter’s favorite cartoon. I wanted to use celery sticks for Peppa’s legs, but it simply was not to be. QUIZ: Where did a Bean Station first grader recently tell a Farm Bureau member his baked beans originated? What is the purpose of a $500 first-time Tennessee Ag in the Classroom grant, renewable at $250 each year thereafter? Rick Wagner is the education writer for the Kingpsort Times News and can be reached at (423) 392-1381 or rwagner@timesnews.net.